If you’re a subscriber, you should be receiving the Summer 2016 BMW Motorcycle Magazine in the mail shortly. Otherwise, you should head out to your local newsstand and pick up a copy in order to see a true rolling work of art. Revival Cycles based their custom Landspeeder “sculpture” (see pages layouts above) on Ernst Henne’s supercharged 1928 BMW R37. Using that motorcycles and others, Henne set 76 land speed records though the 1930s — his last speed record stood for 14 years. 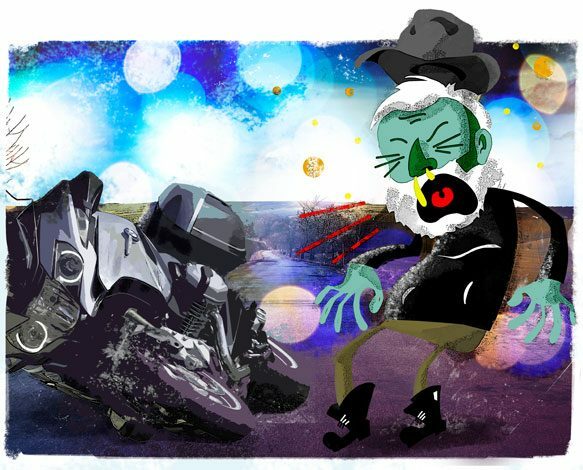 Beyond the usual design and layout, I also enjoyed using my art and cartoon talents to illustrate Fred Rau’s “Riding Sickness?” editorial (see right). It’s great to spend some time away from the keyboard to sketch and add a little humor to an otherwise “gray” page.